If you’re looking to lose a few pounds, hands up if your first move is to go on the mother of all diets in preparation? Don’t do it! Significantly reducing your calorie intake through a crash diet may well help you to lose weight initially but it’s not a healthy way to go about things. Adopting a more controlled approach to losing weight is a better approach and means that you’re more likely to keep the weight off afterwards. Here are some tips for losing weight healthily. Embarking on a crash diet may seem like the best way to lose weight but it’s not the secret to keeping it off afterwards. Think of it as a lifestyle change – to lose weight and keep it off, you need to increase the amount of exercise that you do and make sure that you’re burning more calories than you’re consuming. Crash diets are often lacking in nutrients and in restricting your calorie intake, you may well find that your body is being deprived of vital vitamins and minerals. This can have a big impact on your overall health and deficiencies can become a definite possibility. Watch out for sugar. You probably know that cutting your fat intake is necessary for losing weight but sugar can be just as bad. It isn’t always as easy as you may think to know whether something contains sugar. Other names that may be found on the packaging include fructose, sucrose and corn syrup but they all mean the same thing – hidden sugar. Where possible, swap sugary foods for fruit, raw vegetables and other snacks that won’t lead to weight gain. Stock up on whole grains. Bread, rice and pasta made from white flour is believed to affect blood sugar levels and encourage weight gain so you’re much better off with whole grain alternatives. Don’t cut out treats altogether. Strict diets often fail because they are so hard to sustain and many people find themselves caving in and bingeing on the very foods that they were trying to avoid. You can limit this probability by not cutting them out of your plans completely so that you still have something to look forward to. As long as you’re sensible and tell yourself that you’ll only have a small treat once a week (perhaps on a certain day), there is no reason to ditch treats altogether. The key is not to go overboard or you’ll quickly undo your hard work during the rest of the week. Are you really hungry? Many of us eat out of boredom or other emotions and aren’t necessarily hungry as such. Before you automatically reach for something to eat, ask yourself whether you’re actually hungry. If your stomach isn’t rumbling, there’s a good chance that you’re not and won’t feel any fuller afterwards. If you suspect that you’re just bored, try taking a break from what you’re doing and the distraction may well make the ‘hunger’ disappear. Ease yourself in gently. If you’re not currently getting as much exercise as you should, don’t push yourself too hard too soon. Start with gentle exercise such as walking and build up to more intensive workouts. Even adding five minutes more physical activity to your routine per day adds up over the course of the week. Forget crash diets and starving yourself – the secret to healthy and sustainable weight loss is as simple as eating fewer calories and doing more exercise. As well as being largely ineffective in the long term due to the increased chances of losing motivation, crash diets can also deprive your body of important nutrients needed for good health. So, have you ever tried losing weight? Have your tried crash diets? 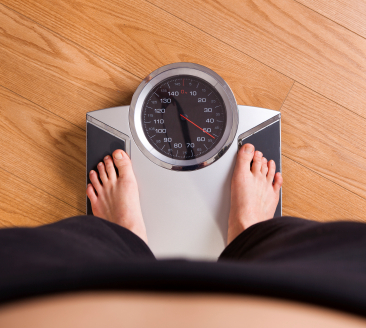 What has and hasn’t worked for you when it comes to losing weight? Please share. I would guess that losing weight in the New Year is the only resolution that has been the same for decades! It’s odd that so many of us seek fad diets and crash diets, when you correctly stated the best way to lose weight is to: eat healthier,eat less, cut out sugar and processed foods, and exercise more. I guess society is so accustomed to instant gratification that we give up on long term solutions too easily. Thanks for the tips. You are very right. Most people want the quick fix. They can’t be bothered to actually think long term and do something that is going to last. It really is a shame because this method of doing things is really the key to success no matter what you are trying to accomplish. Crash diets are a waste of time and energy. They leave you discouraged and often with more weight than before. I eat healthy and splurge every once in awhile. Veggies and meat is the way to go. It is definitely difficult during this time of year, however! You are right. This time of year is difficult. For me, I try to fit in extra workouts. It seems to balance out my splurges and come January I am still where I was before the holidays. I’m going through this right now, trying to lose the last 5 pounds. I cut out soda and also just ate a little less of everything I’d normally eat. Like you said, stop eating when your full & don’t eat b/c your bored (I used to be really bad at that). I’ve also upped my exercise to 6-7 hours a week. Just doing those 3 things have made a huge impact, no extreme or crazy diet needed! Congrats on your success. I am glad you upped you exercise. That is great. The health benefits and stress relief from that alone are awesome. Best of luck with your last few pounds but remember that it is about how you feel and look, not about the number on the scale. You can be fit and weight more than you think because you have more muscle than fat which is ok. Severe diets do not work! I find small changes work best. Replacing one dessert with something healthier or eating smaller portions helps too. I agree. Also, small changes are a lot more manageable and you tend to stick with them better. One of my favourite sweets when I have a craving is dates. They are sweet and nutritious. For me, if I eat sugar, I want more sugar! Also, if I get too hungry, I make some really bad choices. It is hard to stay on track sometimes for sure. One thing I found that worked well in the past is to only keep healthy snacks on hand. That way if you are hungry or get the munchies you have no choice but to nosh on what is good for you. I finally found a workout that I really love (barre). It’s super expensive though so I’ve been trying to find ways to fit it into my budget. I have kinda fallen off the wagon this month–oh december! but i’m still taking classes at least twice a week to help maintain the muscle. i hope to kickstart next month! I have heard a lot of people comment and say they love the barre workouts. I haven’t yet tried them but I would like to. There aren’t any studios where I live I don’t think so videos will have to be the way I go. I personally have done a lot of the Jillian Michaels videos and really like them. The workouts are really effective. I have gotten great results. Miss T I completely agree, to lose weight and keep it off, you have to increase the amount of exercise that you do and make sure that you’re burning more calories than you’re consuming. With out the exercise fat loss never works long term in the long haul! Sweet blog by the way! You are right. Exercise is key to staying healthy in general and aids in maintaining weight loss. I also find it a great stress relief. Crash diets are definitely bad. I can certainly say that intensity has worked for me, but that was more a calculated plan rather than a true “crash” situation. Anyway, I agree that you have to ask yourself whether you are hungry, not fully deprive yourself, among other things, so your tips are right on point in my book. This is a very timely topic too. Cheers! They are called crash diets for a reason to me- they make you crash. They usually deprive you of nutrients and lead you to failure because you just put the weight back on right after you quit them. A full lifestyle change made up of healthy habits is definitely the way to go. I try to be very consciious of every morsel of food when I’m on a diet. If I don’t track it, I lose count and end up eating way more than my allotted calories. Also, I drink a ton of water. Glad to hear you drink lots of water. That is such a good habit to have. I am always amazed at how little water people drink. I love the stuff myself. As far as logging a food diary, this is a great idea. It really helps to see what you are eating at what time of day and where you can make adjustments. I did a crash diet once. I lost 11 pounds in 9 days. While I was happy with the results, as soon as I started eating normally again, almost all of it all came back on. It wasn’t a healthy diet , it was too fast and quite frankly, it was stupid. I’ve been the most successful with weight loss when it’s been slow and careful. Sadly, many of us have gone down that same path and learned our lesson. No it is not healthy to go on such rapid diets. Slow and maintained weight loss is much better for you. Glad you have found success. Diets is not ususally what does it. These are all good pointers. I have been asking myself for sometime now whether it is possible to eat like a glutton, look like Venus and tun like a gazelle? Suspect it is – latest research has shown that it is not so much the calories that we take in but do these come from and how do they enter our bodies. BTW, wher is exercise in loosing weight the healthy way? This seems a biggie to me. If it were like that Marie, we would all look and feel amazing. Unfortunately like anything else, it takes work and upkeep. You are right. Exercise is important but often people’s eating habits undo their exercise. It needs to be a combined effort on both fronts for a person to actually achieve success.